Crisps were thrown onto the pitch at The Valley. 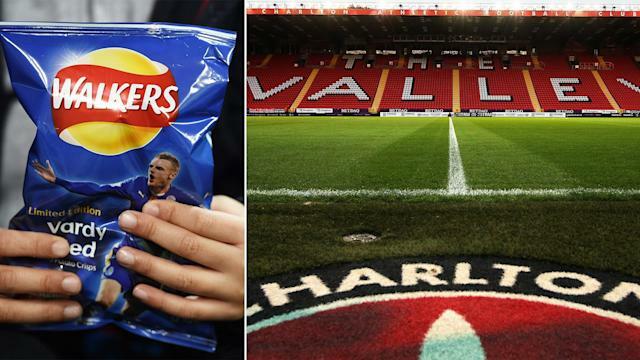 Charlton Athletic's home game with Fleetwood Town was stopped after fans threw packets of crisps on the pitch in the latest round of protests against the club's ownership. Roland Duchatelet is in the process of selling the League One club, with Charlton - managed by former England international Lee Bowyer - in disarray off the field. This week saw the English Football League confirm the organisation will seek to meet the club and the Charlton Athletic Supporters' Trust to discuss the situation. Reports have suggested bonuses owed to staff members have not been paid, while it was claimed workers have been banned from eating crisps at their desks - sparking yesterday's move at The Valley. Saturday's protest, organised by the Coalition Against Roland Duchatelet (CARD) saw dozens of packets of crisps thrown on the field in the opening minute of Saturday's game. Play was stopped while the field was cleared, with the resulting 0-0 draw leaving the Addicks in the bottom half of the League One table. A major demonstration was also held before the game. CARD has long been protesting against Duchatelet's leadership, with a 2016 fixture against Coventry City paused after plastic pigs were thrown on The Valley's pitch by fans.